This is one of the most inspiring video I ever see! 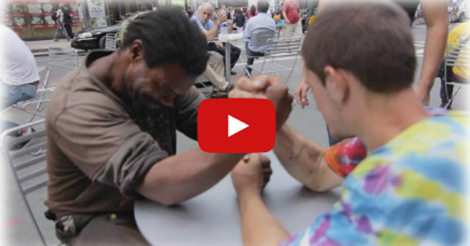 YouTube Pranksters made homeless people arm wrestle for money in NYC. They were offering a $100 prize to whoever wins. Both homeless guy sat down and prepare to battle. What happened next almost brought me into tears. The winner of the challenge selflessly offered to share his winnings to the other homeless guy. It was so unexpected because the winner looks like he is much more in need than the loosing one. What a beautiful and inspiring scene to witness. Watch the video to see it for yourself. Mom Took The Kids Swimming In The Lake, But She Couldn’t Predict What Was Lurking Just Underneath The Surface! OMG! Hottest Toy Of The Year!